Researchers are discovering increasing ways in which pet ownership is good for human health and quality of life. and higher emotional, social, and school/work functioning. According to Maggie O’Haire, PhD, assistant professor of human-animal interaction at Purdue University College of Veterinary Medicine in West Lafayette, Indiana, pet ownership offers significant benefits to both the physical and emotional health of humans. Presenting at the 2017 American Veterinary Medical Association Convention in Indianapolis, Indiana, Dr. O’Haire discussed how animals have become so pervasive in our culture. She noted that the number of people who visit zoos each year in the United States and Canada exceeds the number who attend all major professional sporting events combined. In addition to paying money to see animals in such environments, Dr. O’Haire added, people engage in various other animal-themed activities, such as watching them on television and even attending animal festivals. “We also allow animals to live in our homes,” she said, noting that about 63% of households in the United States have a companion animal. Owning pets can be expensive, given the costs associated with feeding them, providing toys, and seeking veterinary care. As a consequence, many questions remain about the potential returns on the human end of the leash, and these have been the driving force behind research in the area of the human–animal bond, she said. One of the core findings that has emerged from research in this area is that animals provide social support for people. Social support is related to several health out-comes, Dr. O’Haire said, and animals contribute to this in different ways. They provide direct nonjudgmental support, and they also facilitate social interactions between people to help create social networks within communities. Animals can also make people appear more popular and help them get dates. “The research suggests that animals make us look friendlier, happier, more approachable, and less threatening,” she explained. But how does this relate to health and well-being? Dr. O’Haire noted that the presence of animals in the workplace can reduce stress. In addition, she said, some studies in human health have produced dramatic findings. One study showed that people who own pets may be more likely to survive a heart attack. Other studies have shown that pet owners are less likely to need to visit their physicians or require medication for sleep or heart problems. All in all, this amounts to a savings of approximately $11.7 billion per year for the health care system, according to one study. Indeed, in 1987, the National Institutes of Health argued that “… no future study of human health should be considered comprehensive if the animals with which [individuals] share their homes are not included.…” And although this principle has not been followed in every study since then, Dr. O’Haire noted, the concept remains important to consider. These human–animal relationships, and their documented bene-fits on the health and well-being of humans, have been the underlying rationale for animal-assisted intervention. This type of intervention refers to any situation in which an animal is incorporated into therapy for humans, Dr. O’Haire said. This may involve animal-assisted therapy (which incorporates treatment goals), animal-assisted activities (these do not involve treatment goals and may include animals that visit residents in nursing homes), and service dogs (dogs that are trained to assist a handler who has a specific disability, such as posttraumatic stress disorder). Do Service Dogs Provide Psychological Support? Service dogs are known to provide physical support for their handlers, Dr. O’Haire said. However, she also discussed a new study she is leading on animal-assisted intervention, which aims to investigate the emotional and psychosocial benefits that service dogs provide for individuals with disabilities and their families. The study is a collaboration among Dr. O’Haire’s team at Purdue University, Elanco Animal Health, and the nonprofit service dog organization Canine Assistants. It compares service dog recipients and their family members with individuals and family members who are on a waiting list to receive service dogs. Participants completed an online survey that included questions about their health-related quality of life, as well as about how they functioned emotionally, socially, and at work or school. Dr. O’Haire’s team made more than 1500 telephone calls to identify and contact individuals and their families who were eligible and willing to participate in the study. This resulted in a return of 305 online surveys, she said, including 108 from service dog recipients and 79 from their family members, as well as 69 from wait-listed individuals and 49 from their family members. The disabled participants ranged in age from 4 to 71 years, and 34% were male. The most common conditions that affected these individuals were epilepsy (31%), cerebral palsy (19%), and Duchenne muscular dystrophy (14%). Dr. O’Haire used the self-report Pediatric Quality of Life Inventory standardized instrument to assess children’s and family members’ perceptions of health-related quality of life. Domains included physical, emotional, social, cognitive, and work/school quality of life. She also used the Patient-Reported Outcomes Measurement Information System tool to assess other measures such as anger, companionship, and sleep disturbance. So far, she said, the results have shown that those who already had a service dog in the home experienced significantly greater quality of life than wait-listed individuals. They also showed significantly better functioning emotionally, socially, and at school or work as a result of having a canine companion. Interestingly, she noted, these findings show that canine companionship provides substantial benefits not only for service dog recipients but also for their family members. 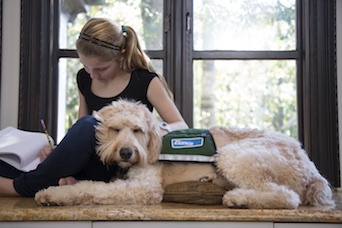 Compared with family members on the wait list, family members who already had a service dog in the home also showed better social and emotional functioning and worried less about the service dog recipient’s health. In conclusion, Dr. O’Haire added that analysis of all the results collected from this study so far is ongoing. Additionally, follow-up studies are currently in the works to help confirm the results to date and possibly provide additional findings about this important human–animal bond, she said.